Some Atari Jaguar fans got white cases because the molds were sold then modified a bit to make fancy cases for intra-oral cameras for dental work. The company making those offered to run off a few more cases for the game consoles. It wasn’t too difficult to work around the alterations that had been made. As a rabid Jaguar fan and owner of one of the custom run dental cases I thought I would share some additional info. The cases sold to collectors do exist and required a back plate to be added if you want to keep dust out and I think the posts are slightly different inside. I never tried putting a jag board in mine. The dental cases also had the dome area the CD drive would cover polished smooth instead of continuing the orange peel texture all around the case like the originals. The dental equipment does exist: https://twitter.com/ejagfest/status/1040883780595208192 and they are two tone blue or beige on white cases. There are some of these being sold on sold on ebay now as the cameras come out of use. There are also fake painted original Jags being sold as dental cases as well unfortunately: https://www.ebay.co.uk/itm//183511304677 (note the orange peel dome). But that wasn’t the end of the line for the Jag molds. The then Retro VGS managed to get their hands on them for their console. They produced a small batch of clear cases for collectors, it was a much smaller batch than the dental cases and they are more difficult to get. These were the same modified dental molds though. The top dome was smoothed on the clear cases and the rear is missing. There weren’t any Retro VGS or finally, Coleco Chameleon formally produced. There were “prototypes” shown though had a black case that matched the dental case molds. I haven’t seen an image of the rear, but the dome is smooth so I imagine there is no back. Don’t forget to mention the nice handle it had to throw it away as far as possible. Too bad you don’t have a handle too. ^this! The number of times that verkakte computer would bomb out while compiling Pascal in college….let’s just say it’s lucky the computer lab was in the basement with no windows. Ah, what windows did for the modern computer, clear cases do for the retrocomputer. My what pretty electrons you have. Are you familiar with the concept of click-bait? Being familiar with the concept and tolerating hyperbolic bullcrap are two very different things. Agreed. Hack-a-day used to be better than this. Nearly every way computers are used was perfected on the Mac. Or developed by the Mac team. This bizarro world anti-apple stuff must be part of the call-out culture and I don’t get it. Did any of you use CP/M or IBM PC machines at the time? They were incredibly awful. No. I said the way they are actually used. At PARC the researchers goofed around. Raskin and the team used his earlier ideas and had a theory and basic principles for low error HMI. One of Raskin’s students was at PARC. I feel that the Canon Cat was quite a big more practical of a device than an SE/30, and dramatically different in design. But I’ll admit I’m a bit of a Jef Raskin fanatic. He does an article about the “greatest computer ever made” about once a month or so. I literally said, in a hackaday post, that I have a cache of SE/30s and I am manipulating public sentiment to drive the price up on the secondary market. 37 years after its release people are still developing games, demos, tools, hardware extensions (it has countless Ethernet and WiFi adapters) for it. Its SID sound is so culture-defining and distinctive that it’s being used in modern tunes. Even people printing cases for it, as mentioned in the article. The Crapintosh was never great, it was always less power for more money. Heck, even an Amiga 2000 emulating the Mac was faster than the original back then. I don’t know if I would agree with “the greatest computer ever”, but it WAS “insanely great”. “The Macintosh SE/30 is the greatest computer ever made” how many times has Brian mentioned this, it’s beginning to get a little annoying. Although it might be the case that he meant it to be sarcastic. Though, that would not be fair to this old machine, because just like all those other great machines they do deserve some respect. There simply isn’t a home computer that is greater then another, how do you judge them? By their pricetag / exclusivity / sales numbers / available software / logo or brand / fanbase. So please Brian, stop this running gag, it’s getting annoying. Which is why you still use your Apple ][ today, right? No. I never had Apple II, but I read enough about it to determine it was a great computer with fairly open architecture. Even now I am using a DOS machine with QBasic sometimes, which is similar feel to what Apple II offered in late 70’s with it’s BASIC. Total control of the machine. Speed. No OS to tell me I can’t do stuff. I had a color monitor expansion board for mine. It was a great computer, at the time. And in the nineties I kept hoping to find one at a good price. I think when I finally found one, I decided it was too late. Character wise, maybe it’s still the greatest. I did like my Mac Plus, which I eventually replaced with a Mac Classic. But I got of it, realizing the Mac laptops I had were just as suitable for use as a terminal as the Mac Classic. But gee, two years ago I bought a refurbished computer, a second generation i7, with 8gigs of ram, a 500gig hard drive, running at 3.4GHz, needless to say quad core. Nice and small, came with Ethernet, but also 2 serial ports and one parallel port. This can’t be the “greatest”, but it’s way better than the SE-30 specs. I may never need another computer. No, it has no identity, it’s like so many other computers, but it’s way better than the SE-30. I had piles of old macs. I still have one at one of my houses with a spring loaded door where the screen used to be and still use it as a mailbox. I had a couple I filled with cement and put a plank across the top and they made a good bench seat out in the back yard. Mac’s definitely had their uses. ROFL, you made my day. Probably nothing to worry about nowadays. I’m sure Trump has put someone in charge of the FCC who has no idea what RF and EMI terminology even remotely is and that maybe they should just shut down the FCC altogether to save money. I don’t remember whether the SE/30 had full metal shielding within the case, but when I was designing computer boards, the objective was to pass FCC certification with the naked board, because if that could be achieved, it had a big impact on the production cost. So it may be that putting the SE/30 in a clear case wouldn’t violate FCC limits. It had two things. A spray coating inside and a metalized paper between the video board and the shell. What? No it doesn’t. Point a tone probe at any extension cord or light switch. BZZZZZZZ. Most of the electronics projects made by hobbyists around the world are not in a proper Faraday cage of any kind and it’s all good. There is no way that is a $15000 mold. More likely $50k to $100k. I think they are going to be in for a rude awakening on the true cost. Correct, if the tool is made in the USA. $15k seems about right if it is made in southeast Asia, though. I have had larger ones made for less. Yeah, $75K if made in Korea in 1985. China put an end to that with really affordable injection tooling. If the ruling ChiComs ever let the Yuan rise to it’s real value, we will be sorely vexed! I sold this in the 1990’s. http://www.regnirps.com/SEF/seitem.htm These guy are going to ruin the value of few that were made, like the new IMSAI 8080’s panel clones did to the IMSAI 8080 value. Your mention there of the system disks makes me think of something better. Clear floooy disks. Probably not now, but I wonder why nobody made them when people used floppies. Or maybe I somehow missed that someone had. 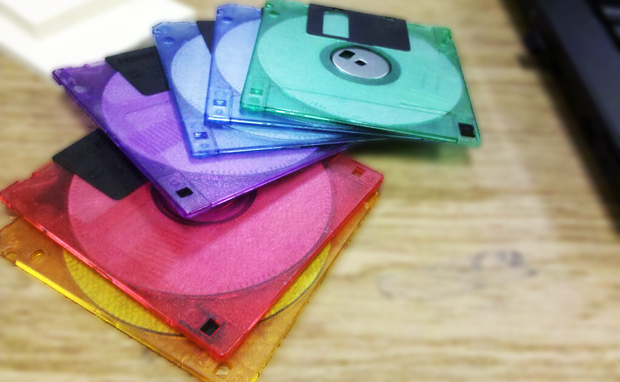 I rember clear neon colored floppy disks ???? Closest I’ve seen is colorful translucent 3.5″ floppies. The challenge with transparent floppies, is that floppy disks had cleaning pads built into them, which weren’t real pretty; you wouldn’t just see a brown disc. I thought Orac already had a transparent case. I think he said the mold was $50,000 he was only asking for a small portion of the costs to gauge interest before spending his own money. Oh im so excited I could pee my pants, this is so much better than a nerdy star-wars light saber. This nerd stuff has to stop! make something USEFUL for a change. Here is an updated video showing the details, pretty cool. Great if anyone wants to see without 68klma membership.